Nicholas @ RK, originally uploaded by Tygriss. One of the first times I met Nicholas, he was wearing sunglasses. Then I learned, he *always* wears sunglasses. It took a little bit, but he finally upgraded from the gas station pseud-o-aklies to real ones. 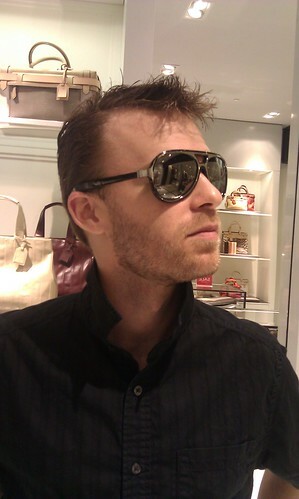 We stopped by Reed Krakoff, Coach's Creative Director and new designer, to try on RK shades. These are my favorite. They make my hubby look a little bit rockstar*.